A ripping and unique combination of science fiction and horror; a community receives a shock when a group of people who were presumed dead re-appear all of a sudden and a strange series of gruesome events follow. Where can you stream Les Revenants? 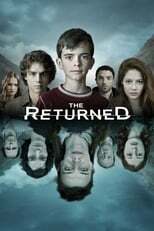 On 2012-11-26 Drama/Mystery TV Series Les Revenants first aired on Canal+. Written and created by Fabrice Gobert, and produced by Haut et Court, Les Revenants has ended and last broadcasted on 2015-10-19.